Our system is currently in operation in The Rustic Stone, Brasserie Sixty6 and Fade Street Social - all three restaurants are associated with the award winnning Michelin star celebrity Chef Dylan McGrath. A customer purchases an online voucher at the value of his choosing and the voucher is emailed to the customer who can then redeem it in the restaurant. 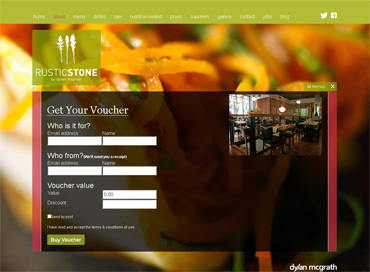 The system can also create "20% off" types of promotional vouchers for Restaurant Marketing campaigns. And most importantly, the redemption rate of these promotional vouchers can be tracked to measure the effectiveness of a marketing campaign. And we have now just created extra functionality which allows restaurants to accept deposit payments for large group bookings. For more information talk to Tadhg on 086 103 9974.